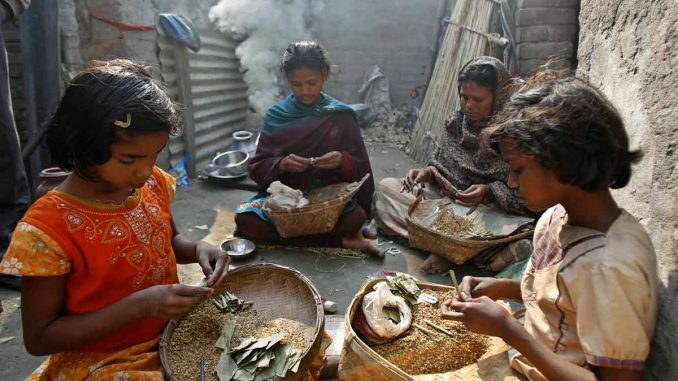 India ranked 100th out of 119 developing countries on the global hunger index (GHI), behind North Korea, Bangladesh and Iraq but ahead of Pakistan, according to a recent report issued by the International Food Policy Research Institute (IFPRI). The country was ranked 97th in last year’s report. This underlines India’s high level of inequality rather than insufficient grain production. The persisting hunger problem also shows that even though the government has to spend a lot to feed its people, it is still not enough. This also prevents the country from allocating more fiscal resources toward infrastructure and other areas needed to develop the economy. The worsening hunger problem is of course worrying and embarrassing for India, which has been the world’s fastest-growing economy over the past three years, especially given that the country is totally capable of producing sufficient food to feed its population. Since 2015, India has overtaken Thailand to become the world’s largest rice exporter, with its annual rice exports exceeding 10 million tons, according to media reports. But it is the uneven distribution of wealth that has left millions of people too poor to get enough food. According to a study released by UK-based charity Oxfam in January, India’s richest 1 percent hold a 58 percent share of the country’s total wealth. There are quite a number of reasons behind India’s high level of wealth inequality, such as the problematic land policy and the limited coverage of the social welfare system. But the most important factor is the country’s lack of industrialization, which results in severe under-employment and unemployment, especially in rural areas. According to the Central Intelligence Agency’s World Factbook, India’s agriculture, industry and services contributed 17.9 percent, 24.2 percent and 57.9 percent of its GDP in 2014, but employed 47 percent, 22 percent and 31 percent of the labor force, respectively. While India’s heavy reliance on the services sector may seem similar to the economic structure of some Western countries, it is hard to ignore the country’s lack of industrialization. Half of the Indian working population are employed in the agriculture sector, and the country’s modest industrial sector can’t generate more jobs. Without enough employment opportunities, the poor obviously don’t have enough money to buy food. Against such a backdrop, the Indian government rolled out the “Make in India” program, which aims to create 100 million new jobs by 2022 and to allow the manufacturing sector to play a bigger role in domestic job creation. As the GHI ranks countries based on four key indicators – undernourishment, child mortality, child wasting and child stunting – the IFPRI report indicated that more than a fifth of Indian children aged below five weighed too little for their height and over a third were too short for their age. It goes without saying that malnourishment in school-age children could have a negative impact on their education, and a less-educated working population certainly doesn’t bode well for a country’s future development. With the IFPRI report and the worsening hunger index ranking, some have blamed the government for not doing enough to feed the people. “$18 billion for a bullet train from Mumbai to Ahmedabad but not enough money for Indians’ basic food to keep them from being hungry,” one netizen wrote. Regardless of whether the Mumbai to Ahmedabad train could boost the economy along the route, the comment to a certain extent adds to the pressure on the Indian government to open its wallet wider for the social welfare system. And the government also faces pressure from the fiscal deficit. According to media reports, India’s fiscal deficit from April-August hit 96.1 percent of the budget estimate for the fiscal year ending in March 2018. In light of this, if the hunger problem continues in the country, the government will face greater pressure to strengthen social protection by increasing expenditure in this area, thus restricting the financial resources available for economic development and infrastructure. With industrial manufacturing hindered by poor infrastructure, it will be hard to accomplish the “Make in India” program, not to mention more job creation for the poor.